Ni no Kuni's visual presentation is second-to-none and the core gameplay is solid enough, but a lack of innovation and some heavy repetition hold it back from being a true masterpiece. The first thing that fans of either roleplaying games or Japanese anime may be interested in is the pedigree of its creators. The art design, as well as some hand-drawn cut scenes, are provided by the acclaimed Studio Ghibli, home of renowned anime director Hayao Miyazaki and responsible for such animated films as Spirited Away, Howl’s Moving Castle, and most recently The Secret World of Arrietty. The game’s actual development is handled by Level-5, who is responsible for games such as Dark Cloud, Dragon Quest VIII, and the Professor Layton series of handheld games. 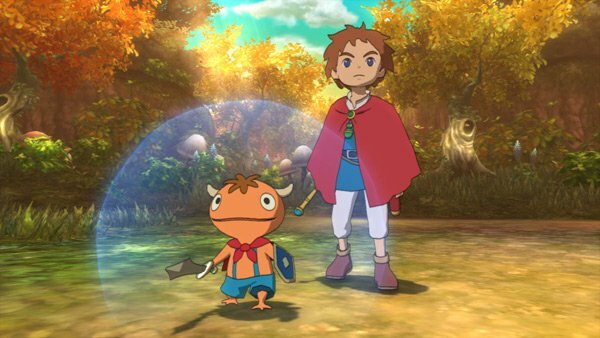 A developer who has made numerous hits, combined with one of the most revered animation studios around, sounds like a recipe for a surefire classic, and while Ni no Kuni: Wrath of the White Witch is definitely beautiful and competently put together, it’s also very traditional in its actual gameplay, which can be both to its benefit and its detriment. The game’s visual presentation is generally second-to-none and the core gameplay is solid enough, but a lack of innovation and some heavy repetition hold it back from being a true masterpiece. The game’s story begins in the quiet town of Motorville, and revolves around a spirited preteen boy named Oliver. Early on in the game, Oliver suffers a personal tragedy, and remains emotionally distraught for days. It’s here that a doll he possesses springs to life in the form of Drippy, a self-proclaimed leader of the fairies who pleads with Oliver to help save his parallel world from the clutches of an evil sorcerer. While Oliver is hesitant at first, Drippy hints that his recent tragedy may possibly be undone by saving the day, and Oliver dons a magician’s cloak and wand and enters a magical world, where the majority of the game proceeds to take place. The story doesn’t take a total backseat to the gameplay, but its overall presentation quality can feel somewhat uneven. Cutscenes are told through a mix of ingame cinematics, the 2D Ghibli sequences mentioned earlier, and conversations that rely more on text and some minimal body animations. Though the early sections of the game provide a good balance, as time goes on, the game seems to lean more and more towards delivering a lot of the story through voiceless text. Considering how much money and effort has been put into the rest of the game’s presentation, it’s a shame that there couldn’t at least be more dialog with voice acting, especially considering how well-done the voice acting and English script can be. Regarding the actual voice acting, I’m going to take a minute and say that Drippy is an excellent character. Sporting an enthusiastic, no-nonsense attitude and a fun Scottish accent, he gets a lot of the game’s best lines. His introduction scene alone is one of the most charming cutscenes I’ve seen in a while. Oliver and his other companions are a bit less fleshed-out, and given some unfortunate catchphrases (If I hear Oliver reply to an astonishing sight with “Jeepers!” one more time, I’m going to lose my mind. ), the actors providing their voices make up for some of those shortcomings with good line delivery. Visually, the game is absolutely splendid. Ingame, characters sport the trademark Ghibli design style and are given a fun cel-shading technique and lively animation. It’s the backgrounds, however, that I found to be the real stars of the show most of the time. Amazingly intricate, detailed, and charming, they offer a real feast for the eyes at points. The occasional Ghibli-animated cutscene also looks great, and the lively orchestrated score, provided by frequent Miyazaki collaborator Joe Hisaishi, adds to the appeal. 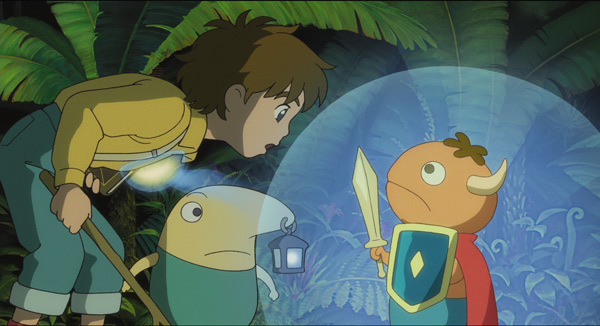 It’s the actual gameplay of Ni no Kuni that feels a bit more formulaic. Players are given a straightforward overworld to traverse between locations, which are mostly limited to standard towns and enemy-filled dungeon areas. In both the dungeons as well as on the overworld, Oliver and his friends will run into plenty of unfriendly monsters to battle. Unlike many older Japanese RPGs, enemy encounters aren’t randomly spawned after the player takes a few steps. 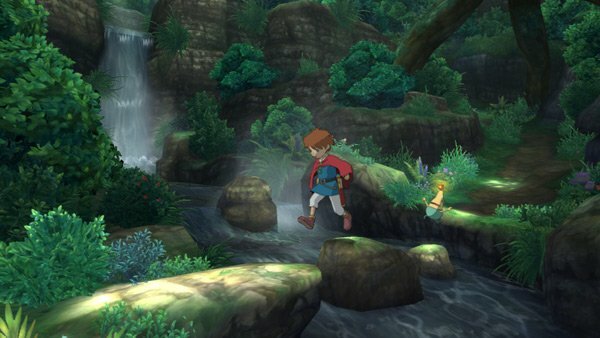 Instead, monsters appear wandering around an area of the environment. Players can attempt to sneak around enemies if they so desire, but this can prove to be rather difficult, as most monsters will immediately run up and initiate a fight if the player falls within their line of vision. In other words, players shouldn’t expect a random amount of battles, but rather a mostly set number predetermined by how many enemies the developers have chosen to put in their way. The actual battling portion of the game is where things get more in-depth. The action takes place on a flat battleground, where the current player-controlled character and enemy monster can run around freely inbetween issuing battle commands. While Oliver and his fellow party members can choose to fight directly on their own, they are generally weak compared to most of the monsters they encounter. The proper way to battle is to use familiars. These are monsters that players capture after weakening in battle, a la Pokemon. Also similar to Nintendo’s famous series is the ability for familiars to transform into a stronger creature after a certain level is reached. 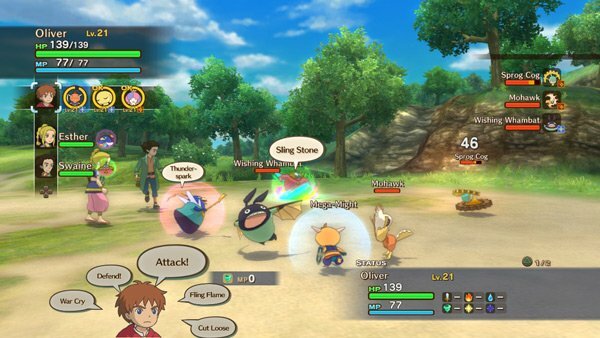 Though Ni no Kuni wears that particular influence on its sleeve, actually using them in battle is different. As mentioned above, players choose one of the three human leads and then pick one of their current familiars (Each character can hold up to three) to directly control. The familiar can then be moved around the battlefield with the left analog stick, while the D-pad switches between different commands, including a basic attack, a defensive stance against powerful enemy moves, or various special moves unique to specific familiars. Battling is easy to get the hang of and fun and challenging on its own; the problem is that there’s too much of it, even for an RPG. I ran into bosses that flat out required me to go back and spend a lot of time retracing my steps to fight enemies again and level up some more, and doing this led to some heavy monotony. It’s definitely gratifying to see your party level up and get stronger, as is the case with any game of this type, but the process should have been constructed to be more straightforward. The game offers various sidequests that you can find in each town populated with friendly NPCs. These range from bounties regarding specific monsters on the world map, fetch quests where you find and/or deliver specific items, and a more unique mechanic involving emotions. Early on, Oliver gets a locket with the power to transfer the very essence of various positive emotions between people, such as courage and enthusiasm. You’ll frequently run into characters who have had part of their heart stolen by the enemy and are missing an emotion as a result, and also find characters in town who have plenty of that specific emotion and are willing to donate some of it to your cause. This is clever in concept, but there’s ultimately little substance to it. The basic template for each emotion transfer is essentially another fetch quest: Find a person who needs a specific emotion, find a person with that emotion, take some of it, and transfer it to the person in need. There’s not really anything in the way of strategy or puzzle-solving, as the necessary emotion is typically specified for you. This feels like something that could be more deep and involving if fleshed out in another game, because what is in this feels half-baked. I like Ni no Kuni: Wrath of the White Witch quite a bit. It’s just a shame that, considering the people involved, I don’t love it. Younger gamers will have fun, people who want an experience similar to classic RPGs from the days of the Super Nintendo and the original PlayStation will be satisfied, and so will those who can enjoy a game for its presentation alone. Those looking for a truly deep experience on par with games like Skyrim, though, will need to look elsewhere.